Ergonomics Today features an article on how ergonomics is an important tool in a successful return-to-work program. “According to Sheryl Ulin, Ph. D., CPE, Senior Research Associate Engineer at The University of Michigan’s Center for Ergonomics, applying ergonomics principals to return-to-work can help the injured worker return to a more productive state more quickly. The key, she says, is starting with an analysis that takes into account both worker and workplace. … Ulin’s experience shows that a successful return-to-work program incorporates worker, doctor and ergonomist. “If the medical professional writes specific restrictions, we may be able to look at other available positions and determine that [a different job] doesn’t have the [restricted] work-related risk factors,” she says. Even in situations where returning the worker to his or her former position is impractical, “we can still accommodate the worker,” says Ulin. “Margoshes likes to try to get an injured worker back into his or her old job if at all possible. To do this, ergonomics is not only the key to workspace assessment, it also becomes an important factor in redesigning the workspace. “It’s not so easy to put people into another job,” says Margoshes. “In our case management, we do everything we can to help individuals return to their old jobs at their same employer. Unfortunately employers on their own don’t always think about how to modify the workplace ergonomically. We work with employer and employee to try to figure out how to adapt the workplace to make it fit,” he says. Labor Sings – songs from the 20s and 30s, including Old Paint, Beltiline Girl, and the Soup Song. Ordinary People, Extraordinary Lives – a collection of photos, stories, and songs from pre-World War I to the present. Buttons and Badges, cartoon art, leaflets and pamphlets and a vast collection of photos and artifacts from the early 20th century to the present. Thanks to rawblogXport for pointing us to this great site. Harvard Business School has compiled a database of 20th century American business leaders searchable by name, birthplace, industry, era, gender, ethnicity, and education. Many are the obvious names you might expect to see on such a list…but there are some lesser known names that are interesting to explore. An article by Anthony DePalma in today’s New York Times (registration required) outlines the onging saga of workers’ compensation claims stemming from the attacks on 9/11. In the immediate aftermath of the attacks, most of the approximately 3,000 fatalities probably involved workers comp: these people were working. They died at work. (Death benefits in New York are capped at a relatively paltry $50,000.) But what about the survivors? What about the first responders? And in ever-widening circles, what about people who suffered post traumatic stress simply by their proximity to the horrifying events? DePalma describes the Brooklyn courtroom where the compensability of claims stemming from 9/11 is determined. He provides the example of a former subway conductor who handed out bottled water immediately following the collapse of the towers and then worked at the 34th street station, keeping order on the platform. Despite wearing a mask, he breathed in the dust and debris brought into the station by incoming trains. In the following months, his breathing became more labored. In August 2002 he suffered a massive heart attack and was unable to return to work. Should he collect workers compensation? Company lawyers have brought up his long-time smoking habit as a potential factor in the heart attack. How can you distinguish between the work and non-work related factors in this situation? A lot of money is at stake. Ultimately, it will have nothing to do with the iconic stature of the 9/11 events. It’s simply a matter of the judge determining whether or not there is a disability, and whether the disability is work related. One of the fundamental lessons of workers comp is that people respond to adversity in different ways. Two people witness the same event: one moves on with life, the other suffers from lingering post-traumatic stress and is unable to function in any work environment. The former continues to earn a living; the latter may collect disability payments for being unable to work. And the “one size fits all” workers comp system has to make sense of it all. What is striking about the 9/11 situation is the scale of the event. It does indeed cast a long shadow. It has been described as the “largest acute environmental disaster” in New York history. Despite the magnitude, workers compensation will play out as it usually does: in a court of law, with the presentation of evidence on both sides. Workers comp may be “no fault,” but it is by no means “no friction.” It is a constant drama of human suffering, of medical interpretation, of “expert” testimony, of point and counterpoint. What is taking place in the Brooklyn courtroom plays out in a similar manner every day across America. Thanks to Ross at The Bloviator for informing us that we are midway into the Cover the Uninsured Week, and that more than 20 million workers lack health insurance. Ross provides a link to a 57-page state-by-state analysis of Americans without health insurance (PDF) commissioned by The Robert Wood Johnson Foundation (RWJF) and conducted by the State Health Access Data Assistance Center located at the University of Minnesota School of Public Health. It uses data from the CDC’s 2002 Behavioral Risk Factor Surveillance System. Pages 23 through 36 provide state-by-state tables on uninsured rates for adults, comparisons of the uninsured by ethnicity, rates of both insured and uninsured who do not have a personal doctor or health care provider, and other important data. Texas has the dubious distinction of leading the nation with 27% uninsured working adults. In conjunction with the week’s activities, the Kaiser Family Foundation issued a study that examines the cost of medical care for the uninsured and how much care they receive compared to fully insured people. “Uninsured Americans could incur nearly $41 billion in uncompensated health care treatment in 2004, with federal, state and local governments paying as much as 85 percent of the care, according to a new Kaiser Commission on Medicaid and the Uninsured (KCMU) study. Even with uncompensated care, the study shows that people uninsured for the entire year can expect to receive about half as much care as people fully insured. 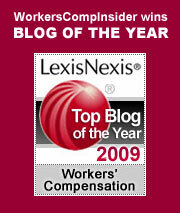 The National Council on Compensation Insurance today announced 2003 workers’ compensation results. In “The State of the Line: Analysis of Workers Compensation Results,” the NCCI struck a cautionary note. Frankly, we find the data are both interesting and confounding. For the sixth straight year, claim frequency, the total number of claims, has declined. Many industry people take great comfort in this. Safety efforts seem to be bearing real fruit. However, the declines in the past few years have mostly been in the less severe injury types. Moreover, BLS data show that frequency has declined in 6 of the last 7 recessions. Perhaps there’s more going on here than successful safety. Maybe more workers than usual who suffer minor injuries are choosing to tough it out in the workplace, rather than go out on workers’ compensation and risk being replaced. Something to think about. But we think that the real story lies in the industry’s indemnity and medical costs, the claim severity. Consider these facts. First, in 2003 the average total cost of a claim increased to $34,600, up from $32,400 in 2002. Second, the average indemnity cost of a claim, the wage replacement portion, at $16,800, rose for the tenth straight year, this year by 4.5%. Third, the medical portion of the average claim, at $17,800, rose 9% and, for the second year in a row, exceeded the cost of indemnity. At $42 billion, workers’ compensation is big money in America. It’s a lot to comprehend. Every 1% is $420 million. In 2003, the industry scored a combined ratio of 108%. Seventy percent of that went to losses, alone. The rest, to various expenses. That 70% is what employers can impact by their actions, their behaviors. In future posts we’ll discuss how. He was reacting to the reportage on a recent on-the-job death of a steelworker who was killed after being struck in the head by material suspended from a crane. Those of us who make safety our business know that, sadly enough, there is nothing unusual about such a death. One of the reasons we so often use the term “injury” on Workers Comp Insider rather than “accident” or “incident” is to emphasize that these are human events that take a toll on flesh and blood people like you and me. Don’t let the media or employers ever get away with dismissing a preventable workplace tragedy as “freak.” Don’t let them leave the impression that there was nothing that could have been done, or the worker’s luck had just run out. What to do? Reporters need to be educated about how such tragedies can be prevented. And employers need to be challenged when they assert that no one could have forseen what happened. That’s almost never the case and it certainly wasn’t the case in the incident mentioned above. Don’t let them get away with it. What? You mean there’s a world beyond insurance?! Here are a few good general business and technology tools and resources we’ve discovered recently. Want to see how you compare to others in your industry? Bizstats is a handy business planning tool that presents a collection of useful financial ratios, business statistics & benchmarks, and an effective and understandable online analysis of businesses & industries. Flummoxed by tech jargon? Held hostage by your technology department? WhatIs? provides definitions for thousands of technology and Web-related terms. Check out the Fast Reference section for some popular tools and topics.